Happy Tuesday guys!!!!! Hope the week's treating you well! Do any of you ever feel restless & confused for no particular reason? Does it ever feel that life is somehow not settling down rightly? Like you are watching some sand in a glass of water.......the sand's trying to settle down at the bottom of the glass......but as soon as it's nearing the bottom, some unseen force is swirling up the water & the sand's floating up all over again??? Think am on some mad ranting spree????? I think so too.....sigh! Sorry for the poor indoor snaps.........but I was so tired after the long evening that these were the best that me & my sis could manage!! The green shrug & yellow tank brought in some cheery color!! The silver ring & earrings are from my recent silver-jewelry shopping spree (refer to my last post here).......I'm in love with these pretty earrings! Super-excited & knotted-up about tomorrow's big match (Cricket World Cup Semi-finals between India & Pakistan).........all fingers and toes crossed........tonight's prayers are all for Team India! Anyways, as am rushing to go trigger-happy & click Spots (well......that's what am gonna call her!) to death........I'll bid adieu to you guys.........have a rocking week ahead..........good night.............sleep tight lovelies! 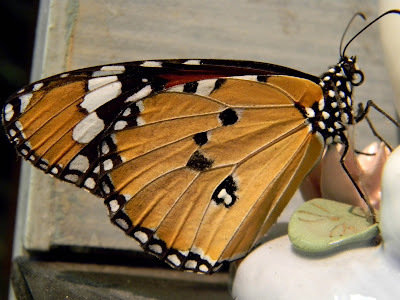 Awwww that butterfly is so pretty!!! And so is your outfit and all the accessories. And I think we all through the ups and downs in the moods. Everything settles down eventually! this confusing thing .. it happens to me as well.. so a same pinch there .. and the colors looking lovely on you !!.. love the jewelery also ..
very nice green and oh I just adore the soes! And what a beauty, that butterfly! But all beauty doesn't last long on this earth...unfortunately...so let's be happy and enjoy it when we can! I know exactly how you're feeling... I tend to go to extremes when I'm in that restless mindset, like deciding to quit my job, pack up and move across the country! I've challenged myself to try to stay in one place and work through feelings of restlessness, but it's an ongoing battle :) That said, you still look lovely. 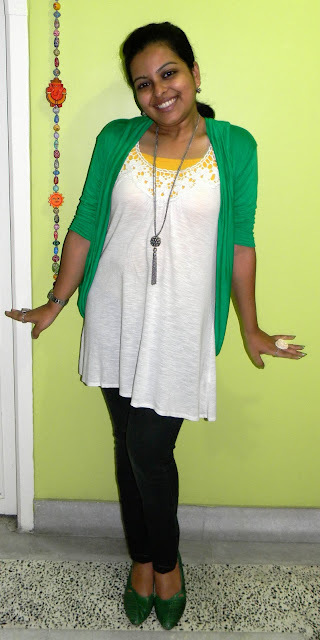 Your green top is just gorgeous, and I love the pop of yellow, too! 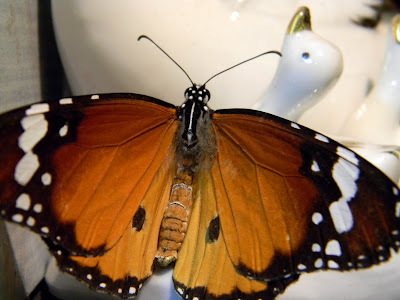 The butterfly is so pretty. How did she get in your room??? BTW did you watch the match??? It was such an amazing one, and now I want India to win the cup. :) Keeping my fingers crossed. Well, don't worry too much. Things will fall in place. Happens to all of us. @Jamie-Lee: It's ALWAYS fun to catch up with ol' friends!! @Cee: My! My! I don't know if I'm in a state to take such huge decisions right now......but hope things get better! My dear princess, you are stylish now, so you will be in the future. 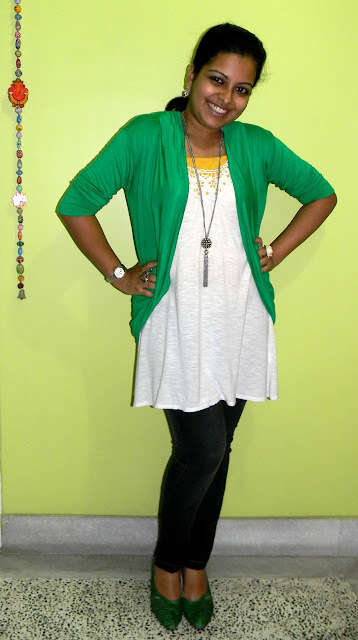 that green cardi is beautiful on you! hope you feel better about everything soon! That feeling your are having is the beginning of a good thing- it shows the soul's appetite for the next stage of your life, and your vague dissatisfaction with the way THINGS ARE NOW is like hunger pangs, the rumble in your stomach that says it's best to be planning for dinner. YOU look gorgeous- I love the way you wear colors, the way your eyes are bright and always seems to have a sparkle and the way you hold yourself. I always get the impression, including this set where you say you are tired, that you own your world, but are gentle enough to not dominate it. oooohh! i really really like the 4th picture! The rings are awesome, and the close-up of the intricate crocheted design on the tank is beautiful. :) But hey! i'm sure everyone has those tough times when you're just confused. ya'know? Just be sure to relax and stay healthy, so you have all the energy you need! :) Take care! I hope all is going well. Can't wait for your next post, darling! anyways, again to tell you i love the white tee and the gren shrug combo!!! 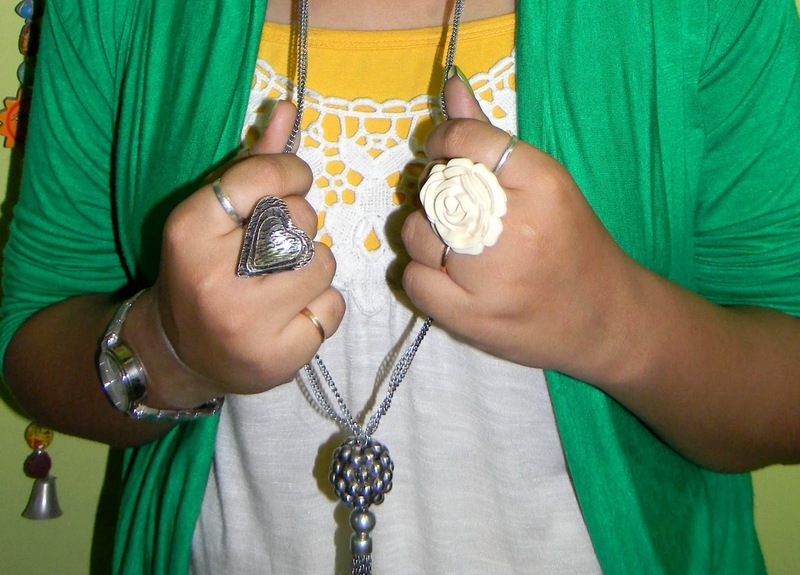 and love the rose ring!!! @Tami: Thanx dear......you are too sweet!! You look adorable. I love that beautiful green. 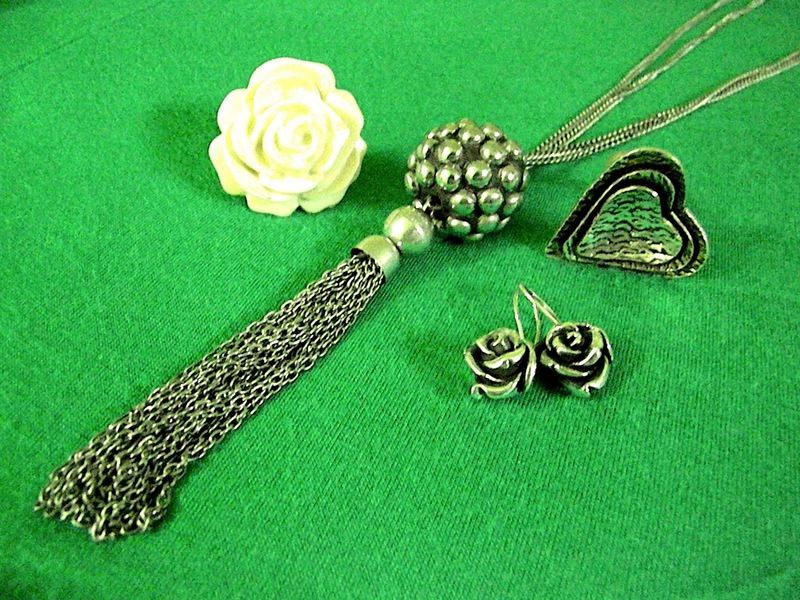 And such pretty accessories. Polka Princess: I've just given you an award. Please check this Sunday's post about it. so pretty green shoes... :) love your blog! Hello gorgeous... I was going to tell you how I feel about you... but you beat me to it!! Yes... there is an award waiting for you here! You do have the sweetest smile ever!